A year ago, Corinthian Colleges, a for-profit educational provider, ceased operations. 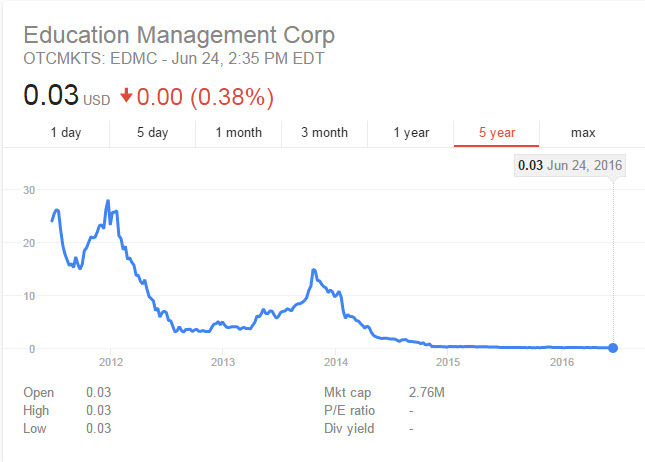 Recent actions at the U.S. Department of Education could spell the end of other for-profits like Educational Management Corporation (EDMC) and ITT Educational Services. The for-profits almost universally rely on the Accrediting Council for Independent Colleges and Schools (ACICS) for accreditation. As a reminder: any U.S. institution of higher education has to be accredited if it is to be eligible to receive federal financial aid doled out to college students. Recently the National Advisory Committee on Institutional Quality and Integrity, which advises the U.S. Secretary of Education, recommended that ACICS’s authority to accredit colleges and universities be rescinded. Last year, ACICS-accredited schools enrolled 800,000 students and were the recipients of $4.75 billion in federal aid. The rationale given by the panel for its recommendation: ACICS has a long history of accrediting businesses that provide sub-standard educations at high prices, ripping off students and taxpayers in the process. Corinthian Colleges, for example, was an ACICS-accredited institution. Should the Department of Education issue a final ruling that is in agreement with the panel’s recommendation, schools that currently have accreditation through ACICS will have eighteen months to find accreditation elsewhere. But this is highly unlikely — the regional accrediting bodies that serve non-profit institutions, like the Southern Association of Colleges and Schools, are not going to put their own reputations at risk by mimicking ACICS. A few weeks ago EDMC announced plans to shutter its approximately two dozen Brown Mackie campuses. Since 2013, eighteen of its fifty Art Institutes have closed. As you can see from the image above, it’s stock value is hovering just above zero and its credit rating is at junk bond status. 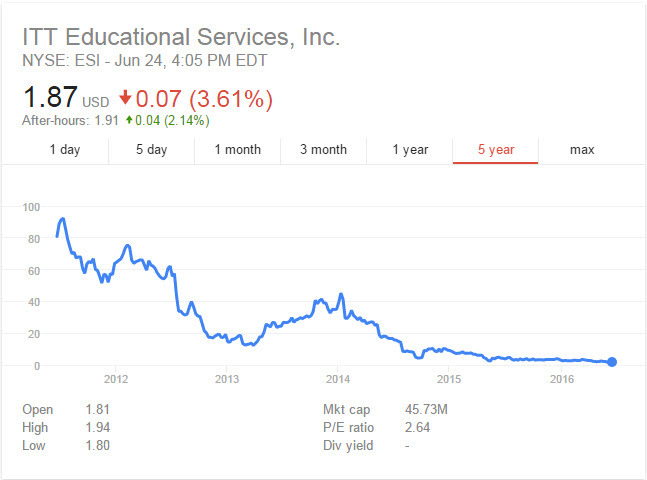 The financial condition of ITT Educational Services is nearly as bad. Once the Department of Education kills ACICS, the spigot of taxpayer-provided cash will stop flowing to these companies and they will cease to exist.